Zane is a rancher with a closed heart. He protects his family and property with stern love, but leaves no room for any other relationships. Phoebe is a softie on the outside but protects her heart fiercely. When she heads to Zane’s ranch on the recommendation of her best friend (and Zane’s sister) Maya, she doesn’t expect to fall into lust. Or love. This installment of Fool’s Gold romance included the requisite – and hilarious – antics of Gladys and Eddie. Mallery has a few other Fool’s Gold regulars make an appearance as well. But for the most part, you could read Kiss Me as a stand alone. You’ve got a cattle drive, campfires, sleeping under the stars, a drowned-out tent, a couple of rescues, and Pheobe talking to Zane’s steer-in-charge to get him to cross a raging river. That makes for many damsel-in-distress scenarios, and a few damsel-saves-the-day ones, too! 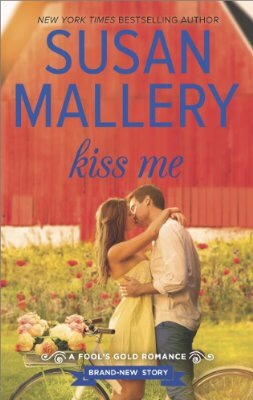 I enjoyed Kiss Me like I enjoy all the Fool’s Gold novels. I liked reading a strong, silent hero, and I REALLY appreciated the sibling and friend relationships. I sort of rushed reading this one because I wanted to hurry and get to the HEA (I must have needed one!) … and now I’m eagerly anticipating Thrill Me!